Christmas unveils a new favorite beer. Great Christmas. Not hectic, drama free, great weather, great food. The highlight was probably little Tommy coming home as a surprise to his mother. It’s great having a midwest, liberal journalist to joust with. From my perspective the funniest thing to happen was to learn that Tina had bought Simon a harmonica for Christmas before we started opening gifts. He’s an amateur musician, guitar, ukulele, keyboard and sax player who often plays at amateur nights and similar events in Gainesville and entertains kids under his care at summer camp so she thought that a harmonica would be a great addition. So did we. We were sure when we got it that it would be unique and a big surprise. We were half right – it was a surprise. Ours came in a set that included the book “Harmonica for Dummies” so, considering Simon’s proclivity to forgetting things, and the small size of the instrument, having two harmonics is probably a good thing. The other surprise was that in all places, I found my new favorite beer at Tom and Tina’s, neither of whom are known for drinking. It was Organic pomegranate wheat beer. Now I just have to find a source closer to home. It displaces Trader Joe’s Blueberry ale. About a month or so back I planted some spinach seed. Spinach is a long germinator so I anticipated not seeing anything for a couple of weeks and so it was. I did expect a higher germination rate than I saw and there were large gaps in the nice straight row I had planted. Fast forward a month and I decided to weed about 2 feet from the row of spinach and to my surprise, amongst the weeds were several spinach plants clustered tightly. I know I planted all the seed in a row so either birds or bugs must have picked the seed and dropped it to the new location. I carefully dug up the small plants and replanted in the gaps of the original row so it ended up looking exactly how I’d planned. Surprising how much weird stuff goes on in the garden. Joey and Mark came up last weekend and finished off the sprinkler project. We replaced one of the control valves that had mis-functioned and, as if by magic, the system works again. That was my Christmas present from them. While we were at it, we added a turnoff valve to separate the house water plumbing and the sprinkler plumbing so that I can work on the sprinkler system without having to shut off the water supply to the house. Nancy whipped up a batch of Rustic Radish Soup. Delicious. The variety of radishes I planted this year are a bit spicier than last year’s crop and the soup definitely has some zip. Our salads are now loaded with radishes and cherry tomatoes and within the next few weeks, will be based on our garden lettuce. These particular cherry tomatoes are great trading material since they are virtually seedless. A friend of Nancy’s can’t eat regular tomatoes because of the seeds so these solve the problem. That same friend has a vegan daughter who gets heart flutters when she even thinks about our garden. We just gave her a load of collards and kale. Put away the lined jeans and break out the shorts. Looks like we have another weeklong stretch of 80 degree days and 60 degree nights. Well I guess somebody has to have nice weather. I’m building up a backlog of plants that should be in the garden by now. I stagger plant seeds indoors to coincide with when space is supposed to come available for seasonal reasons. By now, we should have had at least one minor frost attack but (no complaints) we’re still in the 80’s and the tomato plants are still growing and producing; Ditto a couple of green peppers. That’s taking up two full rows that otherwise would be loaded with winter greens and such. So I have loads of plants scheduled for December planting sitting in the wings waiting for their spot to open. No way am I going to pull out a producing tomato plant in favor of a cabbage or a cauliflower. And I’m not going to make the garden any bigger as suggested by my neighbor. If it was any bigger, I would have just planted more tomatoes to start with and not left space open just in case. I can’t mentally deal with an unused space in the garden. So I just have to keep letting the new seedlings grow, keep watering them, and use them as replacements for the cabbages that we pick to eat. I think I’ve mentioned how spectacular the cherry tomatoes are. I pick every day, my neighbor picks every day and there are still literally thousands of green tomatoes on the vines and thousands of new blossoms. The bush itself tops 6’ high and across. I had this same production in the spring so unquestionably, this is the best Florida variety ever. Can you believe I got the seed from a grower in Maine? Another big downside to blowing the leaves off the driveway is that now it gets plenty of sunlight which promotes weed growth. It’s grown so fast that I had to break out the roundup and spray a full two gallons. I use a commercial generic concentrate so it’s not nearly as expensive as the brand stuff but it’s still an hour of my precious time when I could be doing something productive, such as reading the paper or fishing. While I was spraying the Roundup, my bridge suggested that when the container was empty, I should refill it with a mildew killer, Wet and Forget, and do all the screens on the porch and the window awnings. So all in all, a full morning was killed just because the leaves and pine needles no longer cover the driveway. Plumbing problems Just in time for the holiday season and New Year,. Of the urological variety. I should be getting used to it but every few years I go through a gauntlet of tests and procedures designed to screw up your day. Nuff said. That super cold storm that has been blasting the mid west and east coast finally got here. Drats. It was a frigid 43 degrees when I got up this morning. One thing is clear, I couldn’t handle living in a cold clime again. The forecast is for two more days with lows in the 40’s and highs only getting to 72 before we get back to temps designed for people. Still no frost or freeze words coming from the weather guy so the tomatoes should be ok for at least another week. Breaking out the lined jeans and flannel shirts. Cheer up folks, winter hasn’t started yet. I hate to bore you with seed talk but ……… back to the late germinating Chard. I checked the seed pack and noticed that it’s dated 2011. I bet the older a seed gets, at least chard seed, the longer it takes to germinate. Maybe the seed shell gets harder or something. I also want to expand on my mention of Joey helping clean up around here yesterday. Turns out that may not have been such a good thing. Our gravel driveway and turning circle collect loads of leaves and pine needles, more or less on a constant basis. Every now and again, three or four times a year, I rake them to spread over the parking area, clothes line area, and whatever paths in the jungle need replenishment. That works for me. My rake job isn’t perfect but I kind of like that light leaf covering rustic look. Nature blending in. Joey came up and brought a new, bright shiny gas powered leaf blower and blew the driveway and circle clean in about 20 minutes. It would have taken me several hours/days to rake it and it would not be clean, clean. Now my bride keeps looking out the windows, commenting on how nice the gravel looks. We have an electric leaf blower but it’s kind of a pain dragging the 150’ extension cord and it just doesn’t do the job as well as the gas guy. I could just go buy a gas leaf blower but my experience with any gas machine is that it eventually becomes a problem requiring more work to start it than to actually do the job. I think the solution is for Nancy to lure them back up with promises of pretzel salad to go. I’m also thinking about installing window shades so she can’t keep looking out. How’s this sound? Collard pesto pasta. One thing we have a long position in is collard greens and I really don’t eat them. I grow them for the neighbors and for trading material, but not to eat. I happened on this recipe and figured if there’s anything good you can do to collards to make them palatable, it would be pasta. I’ll let you know if it’s real or just a wishful thinking. So let’s see, we’re not supposed to take vitamin supplements now or wash our hands with anti bacterial soap. Once again I’m ahead of the trends and had stopped both about 5 years ago. That sets me up for the news 5 years from now, that body parts will start falling off because I don’t take vitamins or use anti bacterial soap. Last night they announced that what used to be called high blood pressure is now OK. Wonder if they’ll recalibrate all the blood pressure machines at the grocery and drug stores? Wine and coffee were bad for you at one time but are now beneficial. I was ahead of the trend on that one too. How comes the climatologists waited until Dec 2013 to announce that the coldest day ever recorded on the planet occurred in august 2010? In case you missed the news, it was minus 135 degrees F at the South Pole. This news release slipped past the global warmists until the Edward Snowden of the weather service leaked it. Here’s another garden factoid to tuck away. Swiss Chard seeds are hard little nugget seeds that can take quite a while to germinate. With most seeds I plant, all of a particular variety germinate within a few days of each other; often within hours, but with Swiss Chard, that’s not the case. I plant multiple seeds in individual styrofoam containers, the wide kind you get when you order a scoop of ice cream. Then after they’ve germinated and put on a couple of true leaves, I gingerly ease them out of the container and into larger quarters, one plant per container. When I’ve removed all the plants from the starting container, there’s usually 90% of the starting soil left in the container which I repopulate later with new, different seeds. I’ve found on several occasions that a chard seed that didn’t germinate the first go around and remained buried in the soil, pops out a month later, maybe along with some broccoli seed or lettuce seed or whatever new seeds I’ve placed in the old container. So I end up with chard plants with widely varying maturity even though the seeds were planted at the same time. Guess the name of the dessert Nancy made. The red one. At Thanksgiving one of Tom and Tina’s guests brought a dessert that really turned me on so she got the recipe. It’s called pretzel salad. Really. Just Google “pretzel salad” to get the recipe. I’d like to think she made it just for me but fact is, Joey and Mark are coming up for dinner and to “deliver” my Christmas present aka fixing the sprinkler system and cleaning the exterior of the house. I can really do the exterior work myself but they do in one afternoon what it would take me 3 days to accomplish and it saves me from having to climb up a ladder to reach the high spots. I’m too old to be working comfortably 15’ up a ladder. It’s also Mark’s birthday and he’s getting the first ever Pretzel Salad Birthday cake. Obviously the other pic is the first cherry tomato pizza of the fall season. Tasted as good as it looks. Big decision point coming up. The Toyota just turned over 200K miles. It needs tires and is due for a timing belt change. So probably looking at a $600-$700 investment. Should I sink more money in it or just unload it? We certainly don’t need 3 vehicles but my bride is of the opinion that if we drop down to only two, the truck is the one on the chopping block. She doesn’t get that the truck is the only way to move the poke boat so it’s the essential vehicle in the fleet. My plan is to take the Toyota to my trusty mechanic and have him do a detailed assessment of the vehicle and the likelihood it can reach 250K. The inducement to getting to the quarter meg mark is that in the time it will take to put on another 50K, it turns 20 years old and qualifies for antique tags in Florida. So my boat, car, truck,bride and person are all officially antiques. Couple of garden milestones this week; picked first broccoli, first head of cabbage, probably the last green pepper of the season, and the first radish. We’re also picking a steady stream of cherry tomatoes now, a handful every day with no end in sight. We have so many that I’m making the first cherry tomato pizza of the season. We made our quarterly Costco run this week. Sure glad I own stock in that place. After my first visit years ago in Salt Lake City and seeing the maximally loaded shopping carts going out and the full parking lot time after time, I decided the stock had to be a good buy. It takes some of the sting out of running up a $700 tab. Aside from the fact that I just don’t like to go shopping, especially in crowds, it’s a 50 mile trek each way and kills almost a full day from start to unloading, repackaging. In addition to the freezer in the refrigerator, we have two external freezers. After the Costco shopping event, there isn’t a cubic inch of unused freezer space. Finally getting some bass after a long dry spell. No feeding frenzies but at least some action. It has a long way to go before I’d call it decent fishing. Two reports from Colorado yesterday – one that said Coloradans are the healthiest people with the lowest body mass and the most time spent exercising; the other about another school shooting. Maybe they need to be putting more pasta, mac and cheese, and pizza on the school lunch menu. Sounds like a severe case of carb and sugar deficit. A couple of weeks back, a friend came over to show us his new phone. I’m not a mobile phone guy but this one caught my attention quickly because I could actually read the screen and see the buttons. I also noticed that he had a strong signal in our house; not all carriers do. He had switched to Consumer Cellular and went on to tell me how much money he was saving, yada, yada, yada. Between Nancy and I, neither one of us can really read the phone screen with any kind of accuracy, especially in high ambient light. We only use a phone for voice so the simplest device and service would be more than adequate. I did a little research, Tom didn’t find any problems and then yesterday there was an article in the WSJ about these new mobile startups. Basically they buy bulk time on the major carriers, wholesale, and resell on a retail basis. In this case, the carrier is AT&T. We looked back for a year and noted that in 10 of the past 12 months, Nancy’s monthly cell phone usage was under 200 minutes and on only two occasions had it gone up to 350. I’ve had a Trac Phone for emergency use for almost 2 years and have accumulated less than 5 minutes over that whole period so I’m not a factor in the equation. Half of those 5 minutes were wrong numbers calling me. The lowest level Consumer plan is 200 minutes costing $15/month; next level is 500 minutes at $20. That’s less than half of what we’ve been paying. You can add texting, internet access and other features for additional fees but we’re just interested in basic voice. The phone itself is $60 for the model that caught my eye but they have several others of different capability levels – even an I-phone coming next month. No contract, month to month only. We could also add another phone to share the minutes for $10 a month. I might eventually do that since the Trac Phone is virtually useless to me because of the small screen characters and micro buttons. Nancy got it for me so that when I’m on the beach and she’s playing bridge, she’ll be able to reach me. That’s happened twice and I think she was just testing to make sure I had it turned on. That’s when I noticed that in the beach sunlight and glare, the screen was totally wiped out for me. Since nobody knows the phone number but Nancy, including me, I knew the call was from her but could never have read it on the screen. Oh yeah, there’s a 5% discount for AARP members so the $20 per month is really $19. You can buy the phone online at the Consumer site or at any Sears store so we decided to check it out the next time we were in Daytona, the closest Sears. Nancy loved it so we closed the deal on the spot. We charged the phone for a couple of hours then called Consumer to do the activation. Since our ATT contract had long since expired, they transferred our old number to the new service in a heartbeat. The other good news was that since we were referred to Consumer by a friend, both of us get a $10 credit on our accounts. So far, no bad news. Not sure how much more college football my heart can take!!!! I don’t recall another season with so many come from behind, last minute wins. Good news is that none of them involved the Gators. In the end, the national championship will be either a team from the SEC or a team from Florida-as it should be. Our weather is absolutely perfect and is forecast to remain that way for the next 10 days. By perfect I mean in the low 80’s during the day and mid 60’s at night; mostly sunny with enough cloud cover to keep the garden from cooking. Perfect fishing weather. Doors and windows open, dress code – shorts and Tee shirt. I check the weather at other US locations that I care about on a daily basis and try to envision what I’d be doing if I were there. Still in Bountiful – hiding in bed under a mountain of quilts; ditto Denver and Chicago. In Jersey City, I might venture outside but not for too long. South Carolina, out and about enjoying the warmth. If I golfed, which I don’t, get in a few rounds. Arcadia, out and about but wearing a warm jacket and lined jeans. Lot’s of stuttering from the meteorologists as the hurricane season officially ends and what had been predicted to be the worst season ever turned out to be one of the mildest ever. That’s not just a “miss” but a ballpark problem. Kind of like that 747 that recently landed at the wrong airport. Of course, in hindsight, they have plenty of reasons why it happened, such as too much dry air but the fact is the prediction model they use is flawed. To me it’s the same as all things globally environmental – way too complex, way too many variables to develop really accurate models. We also had the mildest sunspot activity year in a long time – wonder if they’re trying to figure out how to plug that into the equation? I also saw something about sand and dust blowing off the coast of Africa – another partial to the model equation??? Personally, I don’t understand why they even try to forecast the season – it provides zero information – misinformation actually. Are we supposed to do something different if they say the season’s going to be mild, average, or ferocious? I’m happy they can forecast a path and intensity reasonably well after a storm materializes. Other than that, give us a break and keep the predictions for the lab pool. I have to report a blunder that will certainly reset your clock. A few posts back I mentioned that parsnip tops look exactly like tomato plants. Erase that. They were renegade tomatoes that had popped up exactly where I had planted parsnip seeds and just so happen to sit in a straight row. I knew that parsnips had a long germination period, but that was nearly a month ago so I was quite surprised when the real seeds finally germinated. Instead of tomatoes or carrots, I would liken these to celery tops – at least so far. I decided yesterday to plant another patch of parsnips and decided to soak the seeds 24 hours before planting so I’m still determined to learn something about growing them this year. It usually takes a couple of seasons to home in on the right spot in the garden. Other than that, picking cherry tomatoes and butternut squash, the start of the former, the end of the latter. 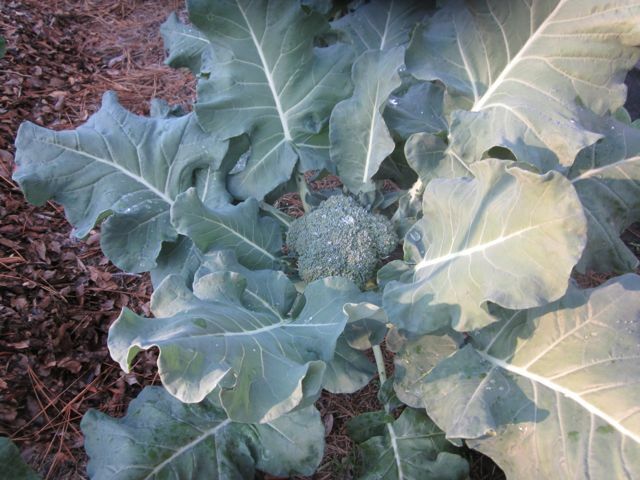 Have a head of broccoli ready by the end of the week. Also picked a few kale leaves to add some green to a pizza last night.